This video shows the build of a “pure water” Water Distiller that easily turns dirty water/salt water etc… into clean fresh pure water. This produces lots of clean water fast. Made from close to 12 feet of copper tubing along with a few fittings (optional stainless steel tube shown as well). video contains full instructions on how to build it. Early testing shows it produces about a quart in 1.5 hrs (and half gallon in 2.5 hrs). note that i soldered on the copper fitting. If you don’t have a torch, they sell “push on” fittings that require no soldering. *if soldering, remember to use “lead-free” solder.The process is simple. It boils water and creates steam. The steam rises without bringing any of the impurities along with it. The steam travels through the coils and slowly cools and condenses. It finally condenses back to its liquid form and drips out as clean water. 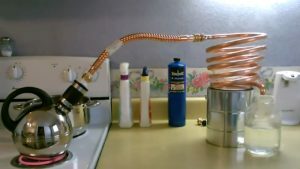 Previous articleHow to build an Inexpensive Geothermal Air Conditioning System to Cool your Home using an Old Car Radiator ,Solar Panel. Next articleDIY Video : How to build your own DIY off grid / grid down Solar Power Back up system from scratch .Complete Video instructional for Beginners.